BYU-Idaho students will get a new Learning Management System in the Fall semester. Students will be switching from the current version of I-Learn (Brightspace) to the new version, I-Learn Canvas. Brother Arlen Wilcock, the Academic Technology Manager for BYU-I, is in charge of the change from I-Learn Brightspace to I-Learn Canvas. He’s working with a team of students to prepare the Canvas courses for Fall semester. The change from I-Learn to I-Learn Canvas has been in the works since Fall semester 2017. The 2018 Winter semester was the pilot semester. During the semester Wilcock and his team surveyed the 16 on campus teachers using Canvas and their students three times to see if they preferred Canvas to I-Learn. More information on the study can be found here. “The very final survey all 16 faculty said they want to go with Canvas.” Wilcock said. According to Wilcock, using Canvas is simpler and saves time for teachers. Students generally lean towards Canvas due to how well organized their are. Organizing the courses is the teachers responsibility and Canvas helps them do that better than Brightspace. With that extra four hours teachers can work on other assignments, work on improving the course and have more time to meet with students. After the trial semester, the President’s Executive Group approved the switch from Brightspace to Canvas in May of this year. In June, the contract was signed and it was announced that the switch was being made. 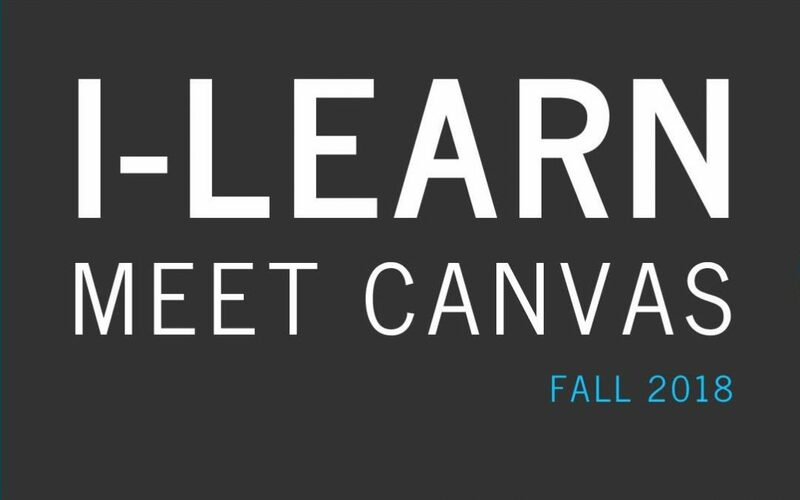 Not all Fall semester courses will be switched from I-Learn to Canvas. Wilcock and his team are primarily focusing on switching 100/200 level courses, Foundation courses and classes teachers have requested to be changed. Some students Fall semester may have to deal with the old and new I-Learn. I-Learn Canvas will operate similar to the old I-Learn. Students will log into I-Learn will be brought to the Brightspace I-Learn Homepage. From there Students will click on the courses they’re taking that semester and if that course is using Canvas, students will be directed to the new Canvas course site where their assignments and grades can be found. If their classes have not made the switch, students will still use Brightspace for that semester. Using any version of I-Learn is recommended of teachers but not required. Some teachers do not use I-Learn at all throughout the semester. This has caused students to panic in the past. Wilcock advises students not to worry. A student may have registered for five classes but only sees four on I-Learn, so they begin to panic. Wilcock advises students to check your schedule. If they see five classes then they’re still registered. That teacher might prefer using pen and paper for their course. If students need help learning how to use I-Learn (Canvas or Brightspace) there will be a kiosk run by the IT Group near the Lost and Found in the Manwaring Center for the first two weeks of the semester. Students can also contact the BYU-I Support Center for help and information. Wilcock and his team are still working on converting courses from Brightspace to Canvas and will continue to work on converting courses until the semester begins. The original deadline for faculty to request the switch was July 6 but some teachers missed the deadline and e-mailed Wilcock asking if they could still switch. Wilcock and his team are working on the late requests but don’t guarantee anything since they missed the deadline. “Regarding usability, Canvas is easier to learn to use and is more intuitive; the interface is cleaner. Brightspace is more powerful, but the learning curve is steeper; the interface is more cumbersome. The faculty who used Canvas in our pilot semester said that in general, it takes 3 to 4 times longer to do things in Brightspace, like creating assignments and quizzes, and grading. Whereas we are the only school in the Church Education System using Brightspace — BYU, BYU-Hawaii, LDSBC, and Seminaries & Institutes are already using Canvas.